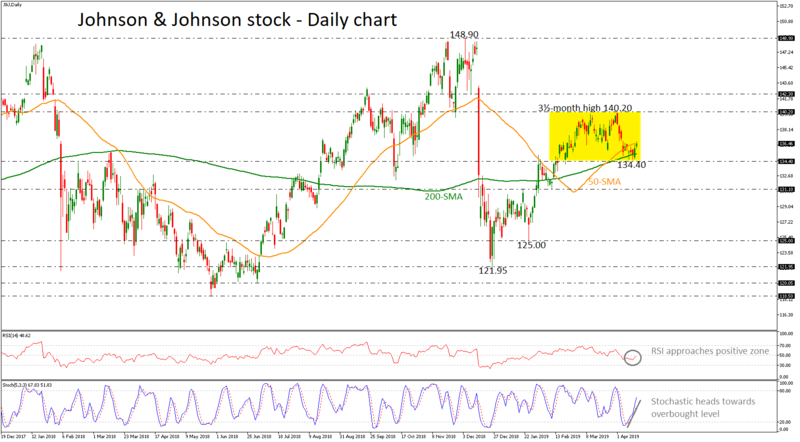 Johnson & Johnson stock price has been squeezed within a narrow range with upper boundary the three-and-a-half-month high of 140.20 and lower boundary the 134.40 support over the last two months in the daily timeframe. The price is capped by the 50-simple moving average (SMA), acting as strong resistance obstacle, while the technical indicators are signaling more gains. The RSI is approaching the 50 level and the positive territory and the stochastic is heading north. Upside moves may drive the price action higher towards the resistance of 140.20 and a successful penetration of this level could erase sideways channel and open the door for bullish movements until 142.30, identified by the inside swing bottom on December 2018. On the flipside, if there is a drop below the 200-day SMA and the lower boundary of the range, support is coming from 131.10, which behaved as support and resistance in the past. More losses could lead the stock price until 125.00, reached on January 24. Having a look at the very long-term chart, the stock price has been developing in a rising tendency since September 2015, creating higher highs and higher lows.